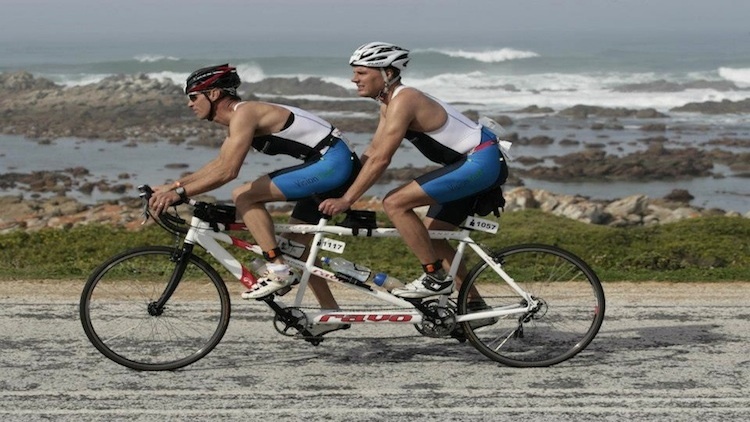 Blind athlete and motivational speaker Hein Wagner and athletic partner Alwyn de Kock successfully completed Ironman in Port Elizabeth on Sunday (14 April 2013), in a time of 12 hours and 47 minutes. De Kock, who is blind in one eye, led the duo through a total distance of 226.2 km, in the three different athletic disciplines. “Between myself and Alwyn we have one functioning eye – but hey there is only one “I” in Ironman!” says Wagner. Wagner and De Kock participated in Ironman to raise funds and awareness for the Institute for the Blind. By sending an SMS with the word blind to 40069, R20 will be donated to the computer training facility at the Institute for the Blind in Worcester. “The school is very close to my heart and I do believe that through proper training a blind person can communicate with the world, read the daily news, browse the internet and get access to study materials and job opportunities,” says Wagner. Wagner continues: “We couldn’t have asked for better weather in PE on race day. As we walked from the hotel to the start at around 06:00 on Sunday morning you could feel the vibe in the air. Alwyn and I managed to finish the 3.8 km swim in 1 hour and 27 minutes. The rope between us worked just fine and although the swell picked up on the second loop, all went well. “We then got on to the tandem and completed the 180 km bike ride in 6 hours and 15 minutes. The only thing to get through after that was the full marathon, a 42.2 km run. That turned out to be the serious part of the race. The first 14 km loop went well. We did however start feeling very sorry for ourselves on the second loop. With just 14 km left we somehow found new strength and completed the marathon in 4 hours 47 minutes, a very reasonable sub 13 hour finish time for my first Ironman. I now know why they call Ironman the hardest day in sport. It’s so true! I was very happy to feel the red carpet under my feet as we raced towards the finish line. All the glory goes to my guide Alwyn de Kock. He did two Ironman’s yesterday, one for me and another for himself. I’m very proud of this medal,” Wagner concludes.